Any given night UNC can do this. Any given night the No. 11 Tar Heels (15-4, 5-1) can beat the No. 10 team in the country by 21 points. Any given night they can lose by the same margin to an unranked team at home. Any given night, these Tar Heels can surprise you one way or another. Tonight, they did it in a good way. 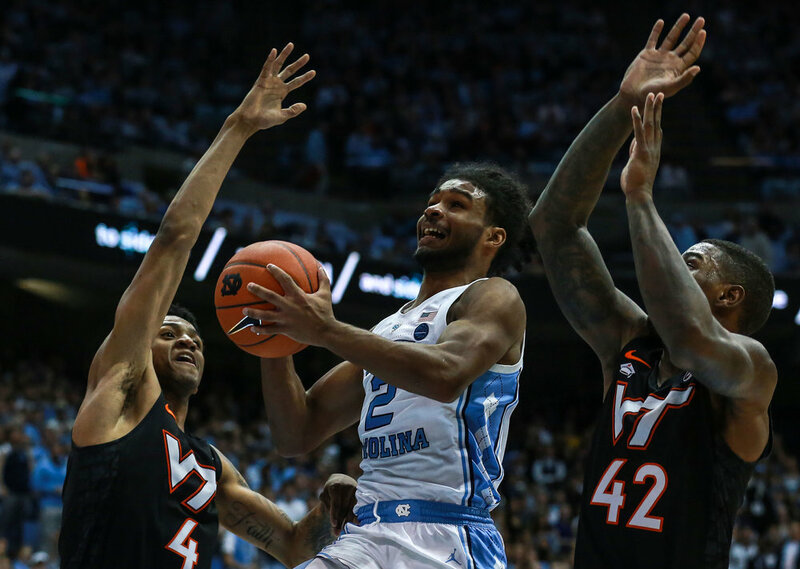 Coby White and Nassir Little made that known in the 103-82 win over the Hokies (15-3, 4-2) Monday. White led all scorers with 27 points on 9-16 shooting, while Little posted a career-high with 23 points on a 7-12 night from the field, including two 3-pointers. Virginia Tech, which entered the game third nationally and first in the ACC in 3-point shooting percentage at 41.8 percent, began the game 6-7 from deep while building a nine-point lead. The Tar Heels, meanwhile, began the game 1-12 from beyond the arc. For a while, it looked like UNC would be producing another head-scratcher in the Dean Dome. The next one did fall, courtesy of Luke Maye. Then the next two fell, both from White. Then two more fell, one from White and one from Leaky Black. By the time Cameron Johnson hit the last three-pointer of the half, UNC had erupted on a 20-0 run, one that gave UNC a 45-31 lead at halftime and a lead it would never relinquish. Carolina’s depth was on full display in its offensive outburst, as five Tar Heels finished in double figures, all while UNC’s leading scorer Johnson (15.9 ppg) had only 8 points on 3-8 shooting. White was especially showing the work he’s done this season. The freshman from Goldsboro finished with 27 points, 7 rebounds, 6 assists and 4 steals, becoming the first UNC player since Joseph Forte in 2001 to lead the team in all four categories. White even added a block to round out his record night. 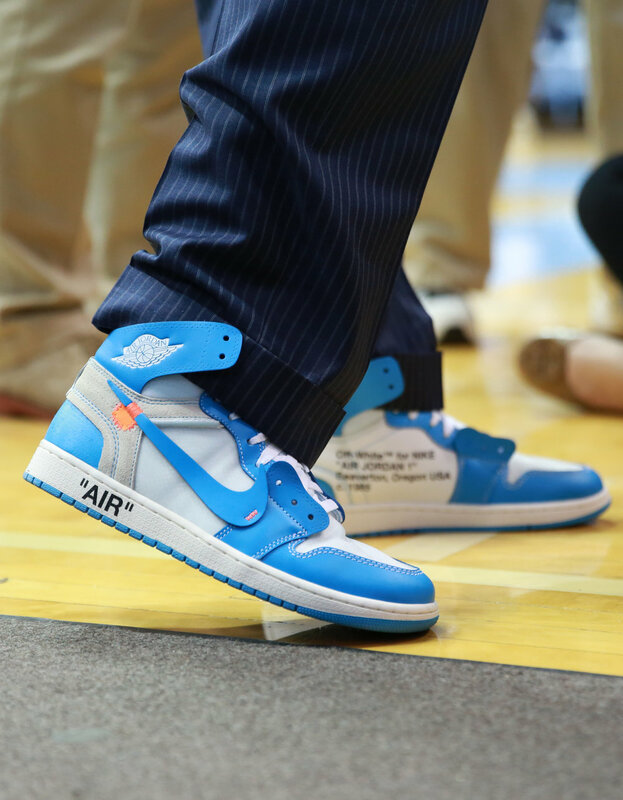 Roy Williams seemed comfortable on the bench as well, thanks to both his team’s play and a fashionable shoe choice. In coordination with the National Association of Basketball Coaches, Williams and his staff wore sneakers to raise funds and awareness for the fight against cancer. Williams, in particular, sported Off-White Air Jordan 1’s, a selection not gone unnoticed by his players. What Williams is sure to understand, though, is the significance of a blowout win that puts UNC in lone possession of first place in a crowded ACC with a week of rest ahead. So, playing in the same building 11 days after its worst loss of the season, Carolina picked up its biggest win over an AP Top-10 team since a victory over Gonzaga in the 2009 NCAA Tournament. Any given night this team can do this. It’s just about which night it is. The graduate transfer was no where near Phoenix the last time the Tar Heels played the Bulldogs. But in the rematch, the Pennsylvania native, and his shooting, was the difference. UNC’s three freshmen roommates sparked a 20-0 run on Monday night to break open the Tar Heels’ 103-82 win and give a glimpse of the team’s incredible potential.